Whether you are someone who is looking to make a little extra money through a product or your services or whether you are looking for some great deals on products and services that you need, FiveBiz may just help you to accomplish your goal. 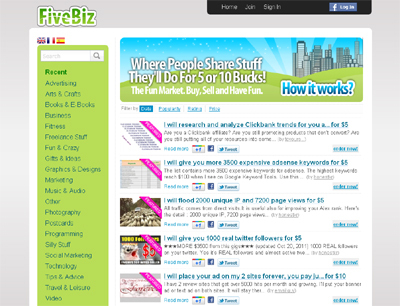 FiveBiz Asks Sellers Just What Are You Willing To Do For $5 or $10? Whether you enjoy drawing cartoons or caricatures, make inexpensive jewelry, write poetry, songs, or articles, or simply have a great funny idea that you think people would be willing to pay for then this site may be a great site for you. You simply post a free ad offering your products or services, make sure that it is something you are willing to do or sell for $5 or $10 and FiveBiz will post it free on their website. Then after your product or service makes money FiveBiz takes a small commission. But, only if you make money. If no one buys your product or hires your services then you pay absolutely nothing. FiveBiz Asks Buyers Just What Kinds Of Goods And Services Are You Looking For? Buyers can read through the ads for those goods and services they need and want or they can post an ad of their own asking for someone to fulfill a request for a good or service they might need. You pay for goods and services upfront but FiveBiz holds the money until the job is completed. It really is that simple and that easy. What Kind Of Goods And Services Are Acceptable? • Offering to tweet someone’s website to your 2000 followers. • Offering logo design, banner design services. • Offering social marketing services. These are only a few of the many ideas that can earn you money or services you can get on FiveBiz. It’s all about what the sellers want to offer and what the buyers want to buy. So, join now and start earning that extra money today. Seller/Buyer friendly! No blocking suspending sellers or buyers like other sites for no reason! 24 hour revenue withdrawals! No more waiting for weeks!